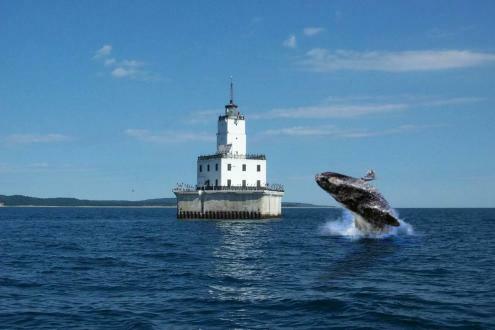 No whale-watching cruises in Traverse City? Several times a year, people wander in asking about the best places to view migrating whales, or wanting to know what companies offer the best whale-watching cruises. 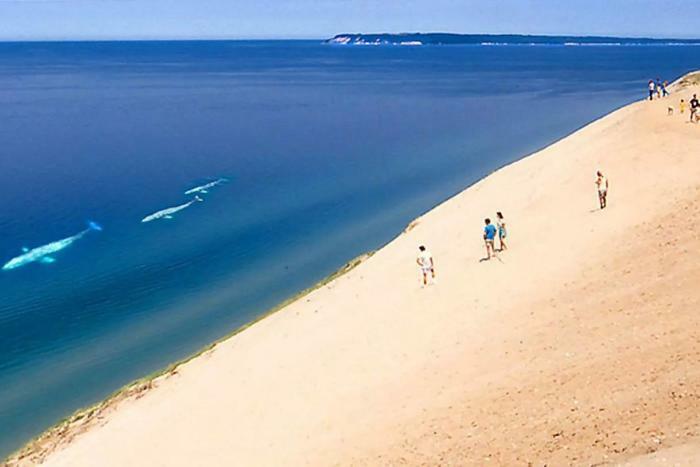 Even though Traverse City is on Lake Michigan, nearly 800 miles from the nearest salt water, its long sandy beaches and maritime flavor sometimes make visitors think they’re at the ocean. Those confused tourists may also have been looking at the Facebook page of the Lake Michigan Whale Migration Station with its evocative photographs of humpbacks, orcas, blue whales, belugas and other cetaceans cavorting in West Grand Traverse Bay, swimming past the Sleeping Bear Dunes and surprising kayakers and cruise boats. The station, which purports to be based on Beaver Island, is followed by more than 7,000 viewers, many of whom enjoy contributing their own stories about whale sightings and encounters, as well as helpful tips about the habits and peculiarities of freshwater whales. Actually, people have been talking about whales and other large creatures in Lake Michigan for a long time. In the summer of 1907, for instance, Traverse City was abuzz with stories about a large mammal -- witnesses thought it might be a large seal or walrus -- swimming in West Grand Traverse Bay. For years, sea serpents, whales and other leviathans were reported so regularly in Grand Traverse Bay that the locals finally were instructed to ignore them. Things got going again in 1985 when a pair of Chicago musicians announced they were embarking on the “first annual Great Lakes Whale Watch” on the schooner Charlotte Ann and began offering tips about how to spot the lakes’ notoriously shy and secretive whales. In 2002, a website emerged offering whale-watching tours along Michigan’s southern coast. “As winter turns to spring and the cool waters of the lake are warmed by the sun, the freshwater sperm whales and dolphins begin their annual southbound 1300-mile journey from Hudson Bay,” it read. “Although there are a number of locks at Sault Ste. Marie, these beautiful and intelligent creatures forge a faster route through nearby streams, and by mid-June, they have reached the breeding grounds of southern Lake Michigan that they know as their "summer home." Although it was possibly intended to be tongue in cheek, some of the information was picked up in 2002 by a researcher for Michigan Studies Weekly, a newspaper distributed to Michigan teachers -- many of whom relayed it to their students. That was how the issue came to the attention of Ron Jolly at radio station WTCM in Traverse City. He got a call at the station from a student who was researching about whale-watching tours in Traverse City. In the summer of 2014, a group of local friends set up the Lake Michigan Whale Migration Station site. The Migration Station has attracted its share of equally passionate fans and detractors. Meanwhile, volunteers at the Traverse City Visitor Center have learned to be diplomatic about the controversy, wishing to spare the feelings of both whale-believers and whale-deniers. Captains of local fishing and sightseeing boats likewise insist that they’re keeping an open mind on the subject -- except for their concern that the whales may eat too many fish.